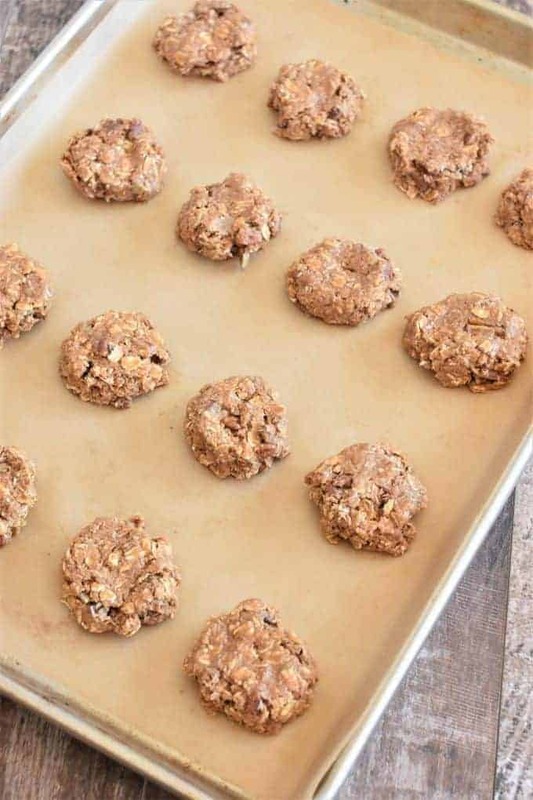 If you’re looking for a delicious, gluten-free and dairy-free dessert, try these soft and chewy Oat Flour Cookies. And, they’re vegan and refined sugar-free too! The year was 2015. I was working full time as a marketing assistant for an engineering company while moonlighting as a food blogger. Mornings weren’t aren’t really my thing, so getting to work on time was a daily struggle. I was lucky to be fully clothed by the time I left the house, which left no time for eating breakfast…that is, not until I arrived at work. Our office had a fully functional kitchen, of which I took complete advantage. I guess I was in there a little too often because one of my bosses even said he was going to move my desk into the kitchen. One way to avoid exploding oatmeal is to use the oats to make cookies instead. That is why you’re here and all. You may be wondering what any of this had to do with cookies in the first place. 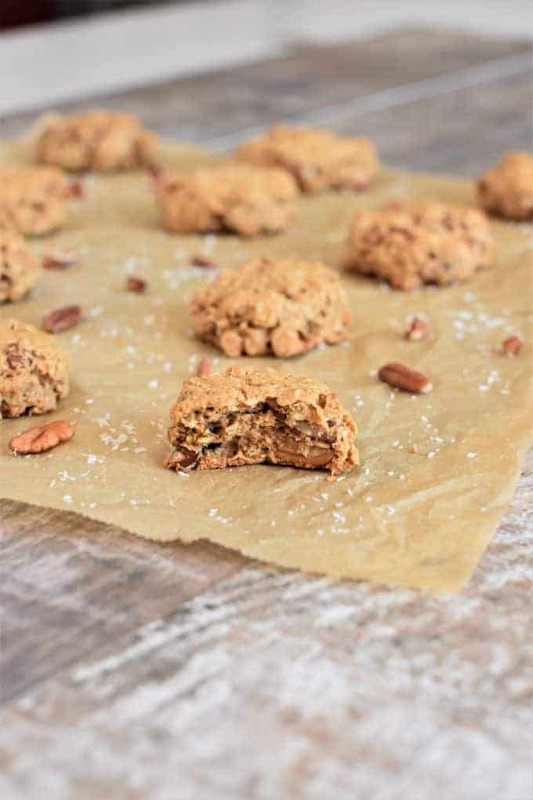 Well, one day while eating my oatmeal and pecans, I had a vision – a vision to make oatmeal cookies with pecans. And to this day, these cookies just happen to be our most pinned recipe on Watch Learn Eat. HOWEVER, I made it a goal to create a vegan, gluten-free and refined sugar-free version to reflect my current way of eating. So, I started what I call “the cookie project.” After some lots of experimenting, these gluten-free and vegan oat flour cookies were born! The cookie project has been successfully completed. On a side note, I was just going to say that would be a good title for a show but according to IMDb, The Cookie Project is already a movie…from none other than 2015! Now if that isn’t a strange coincidence, I don’t know what is! So, now you can get started on your own cookie project by baking up a batch of these tasty treats. What makes this cookie recipe gluten-free? Of course, as the name suggests, these cookies are made with gluten-free oat flour rather than all-purpose wheat flour. Since oats can be subjected to cross-contamination, be sure to purchase certified gluten-free oat flour, such as Bob’s Red Mill. I also used Bob’s certified gluten-free rolled oats in this recipe. What makes these cookies vegan? To replace the dairy-based butter, I used vegan buttery sticks by Earth Balance. I also substituted aquafaba (liquid from canned chickpeas) for the eggs. What makes these oat flour cookies refined sugar-free? Instead of using white granulated sugar or refined brown sugar, I used unrefined, organic coconut sugar as the sweetener for this recipe. Preheat your oven to 350º F and line a baking sheet with parchment paper. Add vegan butter, coconut sugar, aquafaba and vanilla in a large bowl. Stir until well combined. In another bowl, combine oat flour, cinnamon, baking powder, baking soda and salt. Pour flour mixture into butter mixture and stir to combine. Stir in oats, and add shredded coconut and chopped pecans. Fold in the coconut and pecans. Use a cookie scoop or your hands to create dough balls. Press down on each dough ball lightly with your fingertips. Bake approximately 12-16 minutes until cookies are set and edges appear light golden brown. Cool on baking sheet for approximately 5 minutes before transferring to wire rack to continue to cool. 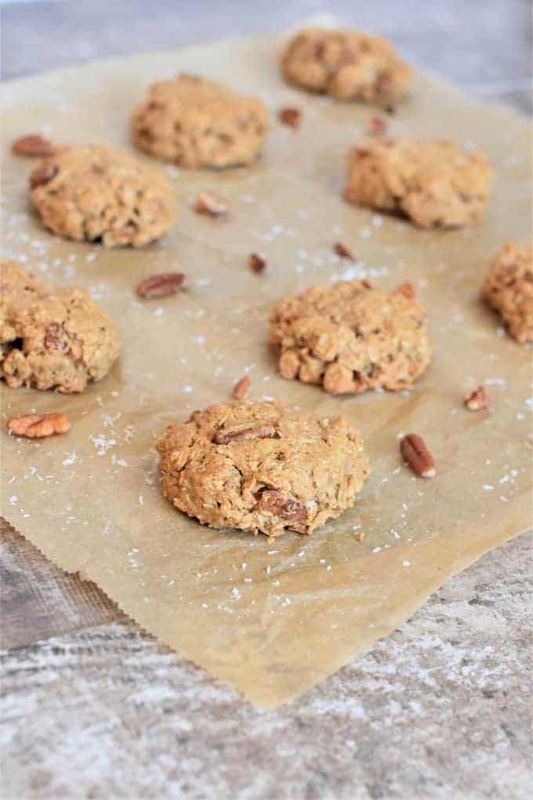 What can be used instead of pecans in this oat flour cookie recipe? You can swap out the pecans for chopped walnuts or even vegan, refined sugar-free chocolate chunks or chips. 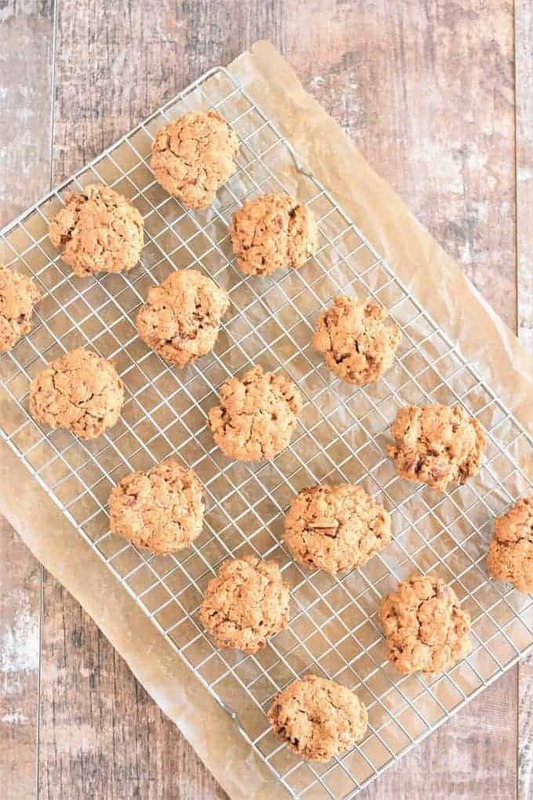 If you're looking for a delicious, gluten-free and dairy-free dessert, try these soft and chewy Oat Flour Cookies. And, they're vegan and refined sugar-free too! Preheat oven to 350º F and line a baking sheet with parchment paper. Stir together butter, coconut oil, coconut sugar, aquafaba and vanilla in a large bowl until well combined. In another bowl, combine oat flour, cinnamon, baking powder, baking soda and salt. Use a cookie scoop (I used a #30 disher) or your hands to create dough balls. Press down on each dough ball lightly with your fingertips. If you don't have a large enough baking sheet, you can bake in two different batches. You want to make sure the dough balls are not too close so that they don't run into each other. Bake approximately 12-16 minutes until cookies are set and edges appear light golden brown (mine took 15 minutes). Cool on baking sheet for approximately 5 minutes before transferring to wire rack to continue to cool. *In place of the chopped pecans, you can use chopped walnuts or vegan, refined sugar-free chocolate chunks or chocolate chips. Please note doing so will change the nutrition information. If you opt for chocolate chunks or chocolate chips, omit the ground cinnamon from the recipe. 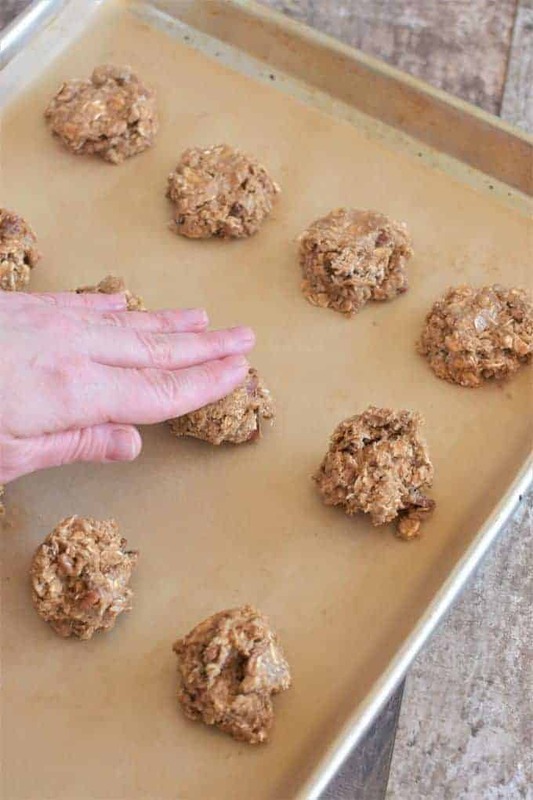 If you eat the cookies right away after cooling, they will be crunchy on the outside and soft and chewy on the inside. Storing them in an airtight container at room temperature will soften the outsides as well. They can be stored at room temperature in an airtight container for up to 4 days.